The treatment of patients who failed to improve with knee meniscal surgery with Stem Cell Therapy is becoming more common. Dennis M. Lox, MD, a Regenerative and Sports Medicine physician explains the stem cell treatment procedure for knee meniscal tears. The knee is a complex joint. 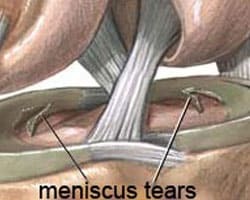 The meniscus functions as a shock absorber and gliding mechanisms for the knee bones. When the knee meniscus is torn, it is not as efficient in this ability. If a large tear, such as a bucket handle, flips up and obstructs the joint, it may be a mechanical block that prevents motion and effective knee use. Surgical removal may solve this. Many meniscal tears are not causing this obstruction. Additionally, removal of any meniscal tissue by surgery creates a hole or divit in the the meniscus. This accelerates the arthritis process. The goal of Regenerative Medicine is to repair, regenerate and heal. If stem cell therapy is used in a meniscal problem that is not surgically treated, the stem cells job is then to fix the problem. This as in all medicine is not full proof. However, stem cells will not cause arthritis of the meniscus as surgery or trauma will. Now, if surgery has resected meniscal tissue creating a hole or divit, the stem cells may repair this hole. This in the best case scenario, would correct the problem, and prevent arthritis development. 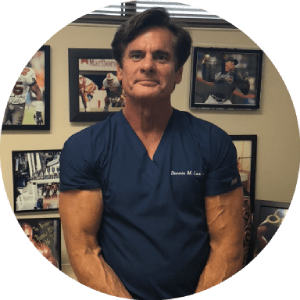 Dr. Lox has treated many athletes, including professional football players who did not improve with knee surgery, and responded to stem cell therapy. Dr. Lox has also treated physicians, who also failed knee meniscal surgery and improved with stem cell therapy. Regenerative Medicine is a rapidly expanding field, and the future directions of treatment appear astounding.